smacked of the supernatural. Since the Hanna-Barbera studio was nothing if not derivative, practically all their new shows during that period were full of teenagers, dogs and mystery-solving adventures smacking of the supernatural. 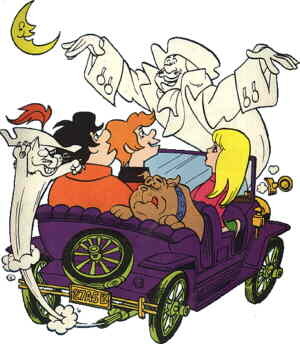 In The Funky Phantom, which debuted on ABC, on September 11, 1971, the supernatural part, a ghost they called Mudsy, was part of the regular cast. In keeping with its tradition, the studio also included elements swiped from outside sources — this show's basic situation was reminiscent of a 1968 sitcom, The Ghost & Mrs. Muir. Like many TV shows, this one put essential parts of the back-story into the theme song, so viewers couldn't forget it during the seven long days between episodes (also, to bring new viewers up to speed in the first minute). The three teens (April, Augie and Skip, Skip being the inevitable one who resembled Shaggy from that other teens-and-dog show) and their dog (Elmo) were out in their ancient, open-topped vehicle on a stormy night, and took refuge in an old, abandoned mansion. Skip made the astute observation that in all the years since the house had been inhabited, somehow, the old grandfather clock had run down. He set it to the correct time, midnight, which resulted in the sudden re-animation of the house's resident ghost, Jonathan Wellington Muddlemore, who dated back to the American War for Independence, and whom they dubbed "Mudsy". Also revived was Mudsy's cat, Boo. The six adventurers, three human (living), one human (other) and two non-human, then embarked on a career of itinerant mystery solving that spanned two years for a total of 17 episodes. They also solved mysteries in 13 issues of a Gold Key comic book, which ran from March 1972 through March 1975. Plus, of course, they had the usual the usual toys, etc., tho not a remarkable number of them. Mudsy's voice was done by Daws Butler, the talented and prolific voice man who gave us Yogi Bear, Cap'n Crunch and so many more. Even his versatile talent was stretched by the profligacy of Hanna-Barbera characters, so Mudsy was done in a style similar to the one he'd used for Snagglepuss. Of the other humans, April was Kristina Holland (Alice in Wait Till Your Father Gets Home), Augie was Tommy Cook (Kid Flash in The Superman/Aquaman Adventure Hour, who also played a live-action Little Beaver in 1940), and Skip was Mickey Dolenz (formerly of The Monkees, who also voiced Arthur in The Tick). The cat was voiced by Julie Bennett (who played a different character named Boo in The Mighty Orbots) and the dog by Jerry Dexter (Harvey in the 1971 version of Sabrina the Teenage Witch). The extreme popularity of Scooby Doo didn't transfer over to the other teens-and-dog mystery solving shows. When its two-year run was over, The Funky Phantom had a few reruns. As recently as 1980, Mudsy and the gang turned up in The Godzilla/Dynomutt Hour with The Funky Phantom. But they haven't been seen much since then. Text ©2004-05 Donald D. Markstein. Art © Hanna-Barbera.